In Bad Viking's point-and-click adventure The Curse of the Mushroom King, also free for iOS and Android, Bad Viking himself as run afoul of the titular Mushroom King, and unless he can gather the (eclectic) items he needs to break the curse, he'll never enjoy a peanut butter and jelly sandwich again! To play, just click on anything to interact, or anywhere on the ground to walk there. Many items you find can be combined, so drag them on top of one another in your inventory to experiment. If you get stuck, well... try to think outside the box! And maybe that box's box, too. It's a weird one, but that's why we like it. The Curse of the Mushroom King, it must be said, is very silly. It breaks the fourth wall, pokes fun at the genre, and is packed to the gills with strange, colourful characters. While the click-to-navigate can occasionally be a little clunky when it comes to going up or down stairs, largely the game's design is extremely user friendly, and the presentation is absolutely top-notch. Some sort of soundtrack would not have gone amiss, but the artwork and the characters attached to them have an appealingly oddball cartoon vibe complete with some pretty funny dialogue. The puzzles can be... convoluted. In most cases, if you experiment with items and click on everything you can, the game does a decent job at nudging you as to what you should be doing, but there are times when it takes what feels like a deliberate attempt to tease how crazy point-and-click puzzles often are above and beyond. 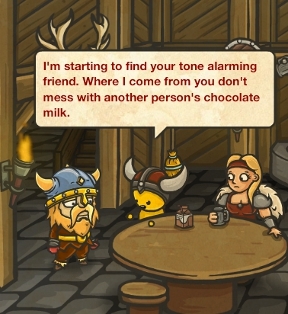 But while it isn't always intuitive, the game's sense of humour and vibrant presentation make it a pleasure to play through, and we look forward to even more Bad Viking adventures in the future eagerly indeed. The Curse of the Mushroom King Walkthrough now available! 1. Talk to the Mushroom King. 2. Take the Black Cloth from the tree, the fishing hook next to the king, and the list of ingredients in the right side. 3. Enter the Inn through the right door. Grab the scissors and the crowbar. 4. Go upstairs. Take the sleeping pills from under the bed and the cup from the drawers. 5. Go downstairs and enter the next room. Fill the cup with coffee, talk to the drunken man and give it to him. 6. Take the broom from the left corner, the thread from the right corner and exit. 7. Head towards the docks, take the shuriken from the tree and proceed forward. 8. Using the scroll, pull the books that are marked and unlock the trapdoor. 1. Grab the armadillo next to the fish market. 2. Use the scissors on the black cloth and combine the result with the thread. 3. Put on the eyepatch and get on the ship. 4. Pull the lever on the mast and go downstairs. Take the rum from the shelf and the map from the wall. 5. Go back to the forest and use the rum on the blue flowers. 6. Climb up the treehouse and take the hook from the cabinet. 7. Go to the beach, combine the hook with the broom and use it to get the floating bottle out. 8. Give the bottle and the map to the pirate captain. 9. Take the boat to the island, take the matches and go back. 10. Take back your armadillo. Grab some gunpowder from the barrel on the ship and load the cannon with the armadillo. Use the matches to shoot. 11. Go back to the island and give the armadillo to the cannibal. 12. Use the shuriken on the cage and open it with the key. 13. Go back to the pirate captain for your reward. 1. Go inside the ship and take the feather from the captain’s desk. 2. Go downstairs and take the key from the drawer below the octopus. 3. Use the key to unlock the chest on the ship. 4. Combine the fish hook with the feather and the medallion and give the result to the lady at the fish market. 5. Take a fish and combine it with the sleeping pills. 6. Feed the fish to the shark on the ship and take the hot sauce from the tank. 1. Use the crowbar on the crates next to the fish market and grab some corn. 2. Take a cannon ball from the ship. 3. Put the cannon ball on the pillar in the forest and talk to the magician. 4. Go to the Inn and talk to the innkeeper. 5. Give the magician the answer to his riddle. 6. Grab the bucket from the cannibal island and fill it with water from the forest river. 7. Put the magic beans under the Inn sign. 8. Give the corn to the bird and use the water on the beans. 9. Take the egg and give to the magician. 10. Give the giant egg to the Viking artist next to the Inn. 1. Go to the pirate captain’s “office” and take the mustache from the sculpture. 2. Give the mustache to the colonel outside the Inn. 3. Give the mustache to the Viking lady inside the Inn and use the dye to make it blonde. 4. Give the blonde mustache to the colonel. 5. Give the cupcake to Red in exchange for chocolate milk. 1. Take the apple from the treehouse and put it on the stump outside. 2. Go to the chained skeleton guy in the ship and use the worm on him. 3. Take the scroll and the key and head back to the treehouse. 4. Using the scroll, pull the highlighted books on the shelves and open the trapdoor. Grab the gem. 5. Enter the Inn through the right door. Put the gem in the socket on the wall and collect your beans. Please be a bit more explicit... For example where is the black cloth from which to cut the eyepatch? I see now, cool. All items were in bold except that one, probably that's why. Note that there's an excellent "hint-through" linked from within the game (click the Help icon). I know that most of us are conditioned not to bother with the in-game help because it's always a useless and sloooooooow video, but this game's different. I enjoyed the game a lot and appreciated that Red from The Adventures of Red (JIG, May 25, 2011)finally gets his chocolate muffin (and seems so happy about it).